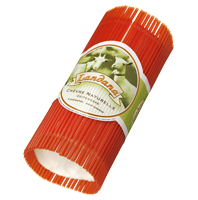 Landana Chèvre naturelle NATURAL with rind is a fresh creamy goat cheese made from full-fat Dutch goat milk. Thanks to its careful ripening, Landana Chèvre naturelle NATURAL has a smooth white rind which lends it its unique mild flavor. The cheese has a gentle consistency and melts deliciously in your mouth. Landana Chèvre naturelle tastes delicious on a slice of toast, as part of a baked dish or in a salad. Landana Chèvre naturelle NATURAL is gluten free by nature.